Lightning Talk: Silence by Chris Powers from Groupon Engineering on Vimeo. Lightning Talks are short 5-minute talks about a topic that interests you. If you would like to give a Lightning Talk, comment below or email us at geekfest@groupon.com! DMARC is a policy-reporting layer built on top of standard email authentication protocols known as Sender Policy Framework (SPF) & Domain Keys Identified Mail (DKIM). At a high level SPF allows receiving email servers to check whether email from a domain is sent using approved infrastructure or IPs. DKIM applies similar concepts at the domain level but uses a private/public key pair to validate pre-defined portions of the email message from the domain in question. From an execution level SPF and DKIM both rely on DNS lookups to function correctly. At Groupon SPF and DKIM are standard authentication protocols used in every country we operate. As such we took the next step to implement DMARC around the world in an effort to fight phishing and create a feedback loop for how our email domains are utilized in the wild. DMARC operates through a DNS record where we are able to tell participating email providers like Gmail, Hotmail, and Yahoo to take specific policy actions (none, quarantine, reject) for email failing SPF & DKIM. When declaring a policy of “none”, defined as “p=none” in the below example, we are instructing the participating email providers to take no action with messages failing authentication. Even though no action is taken we still receive reports on how email is passing or failing authentication from those providers. The reports are sent to the email addresses defined below in the “rua=” and “ruf=” sections. The “rua” option refers to an aggregate report of failures. It can be thought of as a high level aggregate failure report. The “ruf” option is the more detailed reporting path, providing significantly more and detailed forensic reports for every failure. At Groupon we work with Agari, an email security company, to compile this data into human readable reports, which support our DMARC work globally. Overall, the “p=none” step is key in our DMARC rollout process as we use this data to create a baseline for authentication performance and ensure we are in a position to not block legitimate email when we choose to enforce a “quarantine” or “reject” policy. Once any remaining issues have been corrected at the quarantine stage we publish a “reject policy”, which is represented as “p=reject” in the below example. Publishing a “reject policy” instructs any participating email providers to block all email failing authentication from reaching the inbox or spam folder. As a practice at Groupon when we reach this stage we leave the “pct” option set to 100, which instructs participating email providers to block 100% of all email failing authentication. This is done to take full advantage of the anti-phishing benefits DMARC provides and is possible due to the work completed to ensure no legitimate email is blocked by accident. Throughout the DMARC process we have alerts set to trigger if any failures on legitimate email exceed our internal thresholds. These alerts take center stage when we reach the “reject” phase. If our pre-defined thresholds are met, it initiates a rollback of DMARC policies from “quarantine” or “reject” to “none” in the effected region to ensure email is not inadvertently blocked. We will continue to roll out DMARC through the remaining countries to ensure our subscribers are able to benefit from the anti-phishing protection they deserve. Once the process is completed all Groupon email operations will be covered by DMARC. For Game of Thrones fans, DMARC can be thought of as a member of the Night’s Watch, silently standing guard on The Wall. DMARC protects the Groupon realm from phishing attempts and keeps our subscribers and brand safe in the process. We are all very excited that Google has named Groupon on of the Best Apps of 2014. We work very hard to make our app fun and delightful, and are happy that people love it and consistently give us great reviews. We’ve recently refreshed the UI, added your reviews and tips for many merchants, and made significant architectural changes to get us a 40% improvement in startup times. There’s a lot more to come so look forward to our releases in 2015! Well done to all the teams that have contributed to this effort! How do Groupon Customers Fare When it Comes to Gift Giving? It’s that time of year!! And personally, it’s my favorite time of year! I love what the season represents: family, togetherness, generosity, and opportunities to show appreciation for one another. This month I thought I would step back and take some time for something that’s always fun……PRESENTS! As the gift giving season is upon us, the Groupon Data Science team is here to tell you who are the best Groupon gift givers! As a whole, the industry has been experiencing a shift toward online shopping and more recently a shift toward shopping on Mobile. Last year Mobile traffic accounted for 30+% site visits on Cyber Monday. At Groupon, mobile accounts for more than 50% of our transactions worldwide. As more and more people decide to buy products on their phones, we thought it would be interesting to know who are the better gift givers: iPhone or Android users? First off, Groupon users spend 45% more online than your average US consumer! So make sure you cozy up to your Groupon-loving friends this season! Not only do Groupon customers spend more money online, they are more generous to others than to themselves! All customers spend more when buying a Groupon deal as a gift than when buying a Groupon deal for themselves. But as we see later, Groupon app users are the more generous gift givers. Q: Who gets more in the spirit in gift giving? iPhone users. The data suggests that iPhone users tend to get a little more in the spirit spending upwards of 50% more on a gifted Groupon deal than on Groupon deal for themselves. If you have an iPhone user friend spending $50 on average on Groupon deal you can expect them to spend $75 on a gift! But Android friends aren’t too shabby either and compared to all Groupon users, are overall more generous when it comes to gift giving. When looking at a random Monday, the average Android user’s generosity surpasses that of an average iPhone user’s. Q: The holiday season can be hectic, taking care of oneself is important! Who takes care of themselves the best? Android users. Android users spend 10-20% more on purchases during the holiday season. Cyber Monday seems to be the day when everyone goes for that upgrade and pays a few extra dollars to get something nice for themselves. It is the peak time for self-spend, especially for Android users. 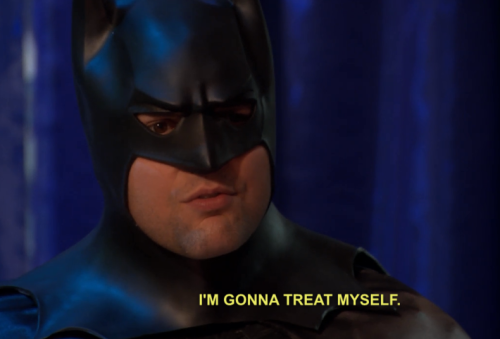 And with Groupon’s crazy Cyber Monday deals why wouldn’t you treat yo self, even Batman does. Q: The most annoying giver gifts items better suited for himself then for the recipient, who is the biggest offender? Neither. Neither Andriod users or iPhone users are guilty of having the same purchase profile for themselves as they do for gift giving. Interestingly, the different platforms’ gift giving patterns stay true to stereotypes: andoid = more techie, iphone = experience. So back to the original question: who gives the best gifts? It probably depends on what you’re looking for: cool gadgets or fun experiences! Either way, Groupon’s got it all this Holiday season and we’re kicking it off a little early with these killer Black Friday deals! Groupon recently opened its green doors to some of the Girl Scouts’ best and brightest for our Scout Out Engineering event. For the second and consecutive year, Groupon Engineering and the Groupon Employee Volunteer Program partnered with the Girl Scouts of Greater Chicago and Northwest Indiana to welcome 5th and 6th graders into the Chicago Groupon office for a morning of learning, fun, and tech engagement. Scout Out Engineering introduces girls to engineering concepts through a combination of presentations and hands-on learning. Groupon’s goal is to excite these girls about technology and keep them interested in engineering and STEM education. One tenet of the Girl Scouts that makes them great is their all inclusive, ‘every girl’ approach. For the Girl Scouts, every girl should be able to participate in any activity regardless of her background or skillset. Last year, Groupon was advised to plan for girls with no internet in their homes, no experience with computers, and no idea who – or what – Groupon was as a tech company. With those guidelines in mind, we planned the program as a hands-on engineering centered event that, for a tech company, was strangely void of computers. If the focus of last year’s program was to introduce the idea of STEM education and emphasize its importance, then this year’s focus was to build on that foundation and actually do something about it. In the six months leading up to our 2014 planning, ideas incubated and matured, technology advanced, and the profile of the ‘every girl’ evolved. In 2014 ‘every girl’ used a computer, a smartphone, and got exposed to some aspect of STEM education daily. The Girl Scouts encouraged Groupon to incorporate computers into the program–many of the girls may have already done some form of coding–and there were no limits on what technology the girls could be exposed to. Scout Out Engineering at Groupon exposed girls to technology in an immediate and accessible way. It became an event for Groupon employees to use their talents to spark interest in subject matter that they are passionate about, and it gave everyone the opportunity to realize how essential empowering young girls can be. When it comes to STEM education at Groupon, there has always been an abundance of employee support and our support for the Scout Out Engineering event was no different. From the planning team, to speakers, to volunteers, Groupon Engineering was ready and willing to donate time, energy, and resources to teach these girls a thing or two about tech. UPDATE: There is some recent confusion around Groupon’s intended use of a product name that the GNOME Foundation believes infringes on their trademarks. While notified by the GNOME Foundation directors that they believed this was the case, we were not able to come to an agreement and were proceeding with the registration of our marks. We apologize for any distress this has caused GNOME Foundation and the open source community. Started as a project at Groupon’s global Geekon hackathon, support for Apache Kafka adds real time querying capabilities to Presto SQL query engine. Presto is an open source distributed SQL query engine for running interactive analytic queries against data sources of all sizes ranging from gigabytes to exabytes, originally released by Facebook. Apache Kafka is a high-throughput distributed messaging system. With the ability of live data queries, Presto can now support use cases that were traditionally only available to special tools such as Splunk. Groupon Engineering is planning to use Presto to analyze its real time event data streams and will replace an existing legacy system. Using Presto will allow engineers and data analysts to correlate current (live) data from Apache Kafka and historic data stored in Apache Hadoop. This capability will allow Groupon to shut down a number of existing legacy systems and reduce operating costs while improving insight into our real time data flows. Groupon Engineering is engaged with the community to deliver excellence in open source development. … and clearly, we are always hiring! Groupon has always been a committed player in the open source community, both by releasing our tools and libraries to a larger audience and by using popular open source projects. So when we took a step back earlier this year to re-assess our global payments infrastructure, we naturally looked at what the community had to offer. We’re now pleased to announce that we have successfully integrated Kill Bill, the open source billing and payments platform, with a subset of our services, and we are planning a wider rollout. Kill Bill provides a platform for building billing and payments infrastructures. It offers a framework for handling recurring subscriptions as well as unified APIs to support virtually any kind of payment gateway and payment method in the world, from wire transfers to credit card payments, as well as crypto-currencies and even Apple Pay. While Kill Bill has been deployed in large scale infrastructures before (such as at Ning), the Groupon environment is truly unique; Groupon as the world’s largest marketplace of deals is present in 45 + countries, with more than 240,000 global, active deals, supporting over 120 payment methods. Our team focused on performance testing the system and made sure that each and every single payment handled is secure and reliable. As part of this process, we discovered the limits of some of the libraries we use, and reported and helped fix bugs in Java 8, JRuby, ActiveRecord and more. The community has been outstanding in this process, thanks to all of you! We believe strongly in the exchange of ideas and cooperation between people. If this sounds good to you, we are hiring!